Learn more about keeping an elderly person in bed at night. 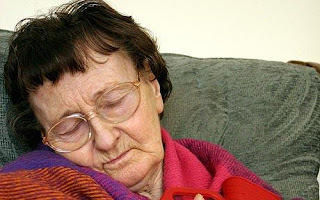 Eliminate the need to get up: The absolute best way to keep an elderly person in their bed at night is to eliminate the need to get up. Many elderly get out of bed to use the bathroom, get drinks, or simply because they can’t sleep, are uncomfortable, or are bored. Find ways to circumvent these things, and prevent the need to get up all together. Bathroom needs: The need to use the bathroom during the night is one of the top reasons elderly persons leave their bed at night. Help your elderly loved one stay in bed by providing bathroom assist products. Overnight adult diapers, bed pans, under pads, urinals, and other products can decrease the need to get out of bed, and thus reduce the risk of slips, falls, and other nighttime hazards. Drinks, food, medication: Eliminate the need to leave the bed for kitchen items, including drinks, food, and medication by using a bedside organizer, or bed stand. Include a water bottle, any needed medications, pain killers, etc., as well as a few snack items. It is also wise to put books, a reading light, and other entertainment options nearby as well. Having these items in arm’s reach helps keep seniors in bed, rather than walking around in the dark. Discomfort and boredom: Often seniors struggle to sleep, wake very early in the morning, or stay up late into the night. Being able to adjust themselves, sit up and read in bed, etc. can very useful, and protect them. Often when seniors first wake, it is easy for them to lose balance and fall. Providing tools like a BedCaddie, which is designed to help seniors adjust themselves in bed by pulling themselves up the ladder like tiers to a sitting position, can help make time spend in bed more comfortable, and eliminate the need to exit the bed. Safety rails: Safety rails can also help to keep an elderly person in bed at night, as they protect them from falling out of bed during the night, and can help them support themselves so that when they do leave the bed, be it day or night, they have something to hold on to as they climb in and out of bed. This extra support is great for helping maintain balance when groggy, or in the dark. Clear clutter, and make sure there is a clear path to bathroom, kitchen, etc. Use light, night lights and motion sensor lights can help a lot. Make movement safe with non skid mats, lit walking paths, motion sensor lights, bed rails, and more. Make sure they have secure footing with slipper socks, or socks with traction built in. Be careful with furniture placement. Learn more about the best products to aid in keeping an elderly person in bed at night, and insuring their safety. The CareGiver Partnership offers 500 items for senior care and care giving, as well as a staff of knowledgeable product specialists that can help you find the best products for your unique needs. To contact a product specialist call 800-985-1353 M-F 9-4 Central. Thanks for a great read. All the mentioned tips are absolutely mandatory in order to help our elderly beloved ones safe ! Really appreciate !